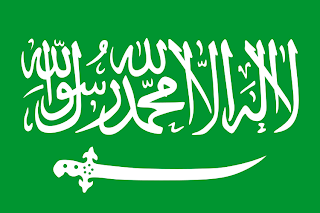 The first Saudi state was centred round the city of Riyadh, and formed by Muhammad ibn Abd-al-Wahhab, in 1756. He was supported by Prince Muhammad Ibn Saud. The House of Saud rose to become the dominant state in the area, and proceeded to spread their influence, and spreading their empire to spread over all the Arabian peninsula. With this empire challenging the Ottoman Empire, the Ottoman Sultan set about reconquering the territory, finally routing the Saudi forces in 1818. 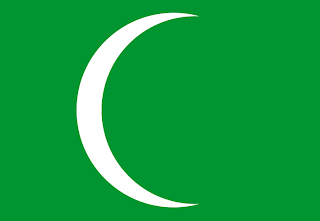 The first flag of the Saudi empire was a simple green banner, the colour of Islam, and placing upon it a simple white crescent. 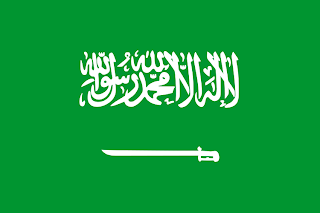 The House of Saud reformed, and re-established the Second Saudi state in 1824, and continued with the green banner of before. 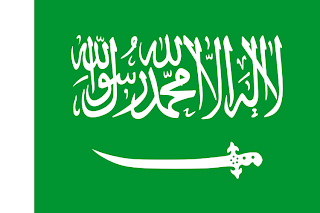 However, the second Saudi state fell in 1891, when it succumbed to the forces of Al Rashid of Ha'il. 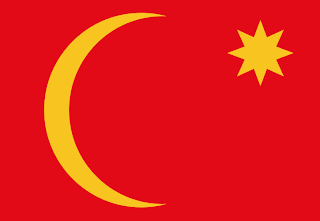 The flag of the Emirate of Ha'il was a red banner, on which was a golden crescent in the centre, with a golden 6 point star in the upper fly. 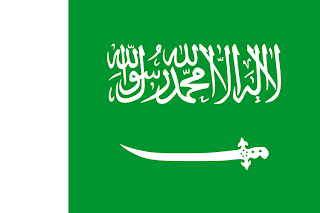 The third State of Saud was established in 1903, and between 1913 and 1926, the new Saudi Kingdom expanded by annexing by force or treaty, the other states and Emirates around it, such as the Emirates of Ha'il, and Hejaz. 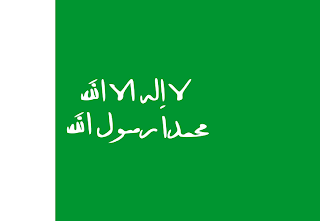 During the Kingdoms early years, the head of the House of Saud took the title of Kind of Nejd, and took to using a new green banner. This time, with white Arabic text. In 1921, a new flag was introduced similar to the flag in use today. 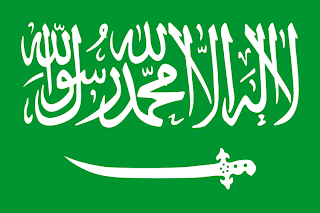 This flag replaced the text with with the shahadah, and under it, a white Arabic sword pointing from the fly to the hoist. From 1926 to 1932, the flag had a white border added, and the sword removed. From 1932 to 1934, the flag was altered again, this time, with the sword replaced, and now pointing from hoist to the fly, and a white stripe running along the fly. From 1934 to 1938, the stripe was thinned down, and the sword switched round. From 1938 to 1973, the stripe was removed, and the text enlarged. Then, in 1973, March 15th, the current flag was adopted. The text was shrunk a little, and the sword was simplified. 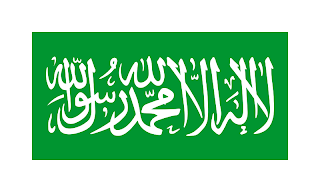 The Saudi flag is one of the few in the world where its manufacture differs from one side to the other, to ensure that the shahadah is correct on both sides of the flag. The sword was included to represent justice. 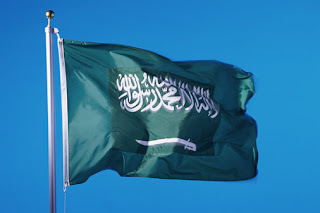 The Saudi flay is traditionally sinister hoisted, meaning it is hoisted to the left of the flag pole.